Archaeological tour specialist Peter Sommer Travels is set to explore some of the most remarkable ancient sites of the Mediterranean this September on a series of spectacular yacht expeditions in Turkey. Four upcoming itineraries will travel through magnificent coastal scenery aboard traditional gulets, wooden schooners, visiting picturesque villages, unspoilt coves and fascinating ancient ruins. Each expedition caters to small groups of no more than 16 guests, travelling at a lazy pace along Turkey’s south-west coast. Hosted by expert guides with academic backgrounds in history, art and archaeology, they combine the remarkable past of the ancient lands with an idyllic journey and a chance to sample the region’s superb food and wine. Cruising to Ephesus - beginning in Bodrum, this cruise heads north to the stunning ruins of Ephesus, one of the best preserved Roman cities in the Mediterranean. En route it visits sites including the ancient harbour of Iasos, the sanctuary to Zeus at Labraunda and the great oracular temple at Didyma. August 30 to September 6, 2014. Max 14 pax. Cruising the Carian Coast – from Mediterranean to Aegean – sailing west from Göcek to Bodrum, this cruise offers a mix of fantastic ancient sites like the monumental wonders of Knidos and Kaunos, plus spectacular landscapes on one of Turkey’s least-developed stretches of turquoise coast. September 6 to 3, 2014. Max 16 pax. Cruising Western Lycia – exploring a superb mountainous coast and its extraordinary culture, with plenty of opportunities to swim in crystal waters. Discover the world’s best preserved Roman lighthouse at Patara, the stunning ancient site at Xanthos, and the beautiful villages and ruins at Kekova. September 13 to 20, 2014. Max 14 pax. 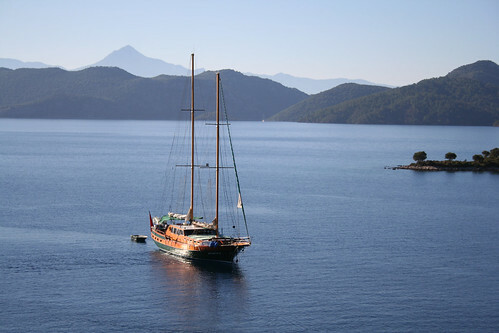 Specialising in small-group expeditions, Peter Sommer Travels offers more than 20 different expert-led land tours and gulet cruises among the ancient sites of Turkey, Greece and Italy. The company is headed by archaeologist and documentary maker Peter Sommer, who in 1994 walked 3,200km across Turkey retracing the route of Alexander the Great. He later worked on a BBC documentary, In the Footsteps of Alexander the Great, and created a 19-day tour of the same name, cited as one of the world’s ten best educational holidays by National Geographic Traveller. *Tour prices include transport, accommodation, most meals, crew and guide services, and all entrance fees and tips on excursions. Excludes airfares.